Gathering with friends after a long or not too long, first, I want to talk to, to discuss any changes in life, new interests and new friends. The usual program of entertainment in the form of a feast and watching programs or new movies can be annoying. To avoid boredom, you can come up with interesting games that will further unite and have fun in a friendly company. Lately becoming more popular table games. Previously, such games in which had chips to move around the playing field and perform some tasks that were very common, but then ceased to be interesting to the youth. Now a large company again enjoy playing Monopoly or other game of business, various strategies or historical subjects. Entertainment kind of Activities can combine and table games, and pantomime, and word games. Fans can even arrange home chess or checkers tournament. Various themed dominoes or bingo will give you a good time for a friendly fun company. Lovers of card games you can spend time playing poker, whist, bridge or the usual "Fool". For restless friends if you have enough free space, you can organize outdoor games. Although, of course, outdoor games are more designed for street, some of them can be done at home. Popular game from this category is the Twister, where you will have to make the most ridiculous postures to stay in the game. The size of a Twister Board can be different size as the number of participants. You can also have a tournament on table hockey or football, if you have such devices. Now quite common variety of dance and sports games, because they can be installed on the computer. Another entertainment for a more relaxed company can be so-called intellectual games. This includes the popular "Mafia" or "guess who killer", in which all the players need to calculate the negative characters, and these characters need to divert suspicion from himself. You can play familiar from childhood game "Broken telephone" - adult company it will seem even more hilarious than in childhood. Games Association games or riddles can also appeal to a large company, because they don't even have to get up from the table. A bit is the game "Crocodile" or "Pantomime" when the master needs to show without words the hidden word or phrase to the rest of it figured out. As a variant of this game is seen drawing the hidden word on the whiteboard, or simply on a sheet of paper, also without a word. There is another interesting game in which the participants glued to each other on the forehead stickers with some of the hidden character, in addition, each player needs to guess which character he is by asking questions about themselves to other participants. 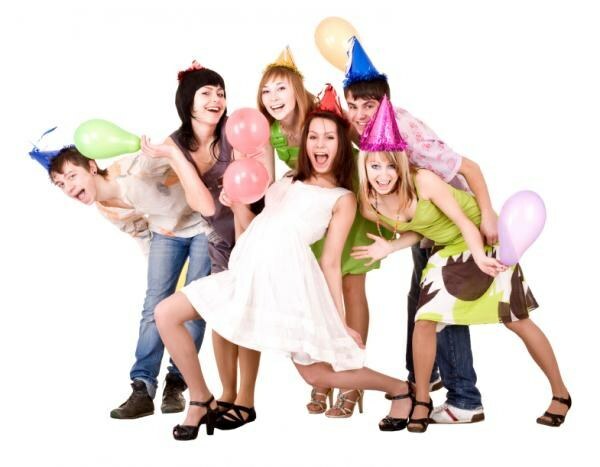 If a party arranged on the occasion of birthday or received an award, you can arrange a holiday games like "Forfeits", when all the guests the birthday child gives tasks. Also popular games on the knowledge of the celebrant and his interests, and you can organize everything as in different television shows, for example, "Field of dreams," "Liar," "O lucky man", "the Weakest link" etc. all the more Difficult there will have the organizer of the entertainment. For large companies, and various humorous quiz or a game of "Question-Answer", when a variety of delicate and simple questions and appropriate answers to all pre-compose and printed on paper but the players only get a separate card with the question and the reply card and read aloud. Can be very funny coincidence, for example, "how Often do you ride public transport without a ticket?" "Without witnesses, of course, go" or "do you Want a lover (a lover)?" "Without a couple of drinks, I can't say that", etc.